This nut and seed bread is quite unique in that it’s not light, fluffy, and airy like your typical flour-based bread. Quite the opposite – it’s chewy, nutty, hearty, filling, moist, and very satisfying. It’s also free of grains and pseudo-grains, and very high in fiber and protein. I will go so far as to say that this bread is good for you. Oh and did I mention that the slices of this nut and seed bread make for a fabulous toast? Smear it with some peanut butter and raw jam for breakfast or top it with some sprouted hummus and greens for lunch. If you wanna keep it simple, just put some vegan butter on it. Growing up in Europe, bread was something that accompanied almost every meal of the day. Not just in the Czech Republic where I was born, but in every European country I got to visit. Soft and warm baguettes in France, nutritional dark and hearty rugbrød in Denmark, fluffy and chewy tijgerbrood in Netherlands, thin and salty pretzels in Germany, crusty round kaiser buns in Austria, herbaceous flat focaccia in Italy, or pita-like lepinja in Croatia. While every bread is special in its own way, one of the European breads always stood out to me – the Norwegian fjellbrød. If you’re all about a dense and hearty loaf of bread, the fjellbrød is all you need. It’s free of sugar, free of white flour, and loaded with whole grains and seeds. It’s also incredibly easy to make – since it’s a no-knead bread, there’s no rising or final proofing. Admittedly, bread has always been a big deal in my family. This is mostly because my mom and dad love bread. Whether we were at home or on holidays, my dad would get up early in the morning to buy the freshest local bread possible. I would often join him just to smell the aroma of freshly baked bread on the streets, wafting tantalizingly from the bakeries. As I stepped into one of the bakeries my dad chose, I experienced a magical whirlwind of nutty breads, buttery croissants, and delicate puff pastries. I loved watching the bakers at work as they filled the shelves of the bakery with breads. I listened to the crackling of the crust as the loaves of bread were cooling down and couldn’t get enough of the aromas lingering in the air. This whole experience helped me appreciate bread-making in a new light. 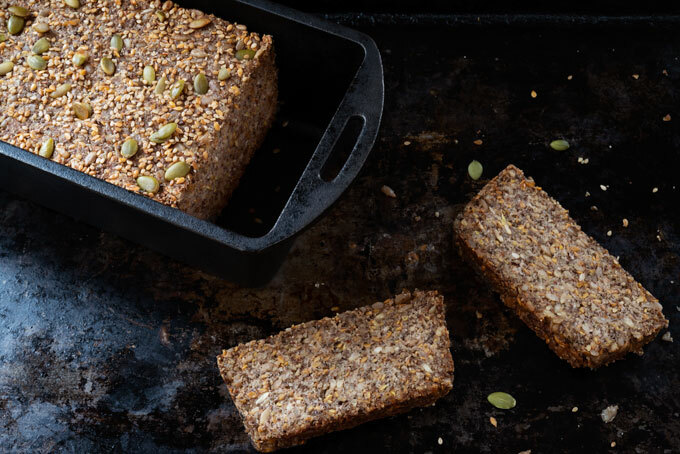 While this nut and seed bread recipe is very flexible, there are a few essential ingredients. If you don’t like almonds, hazelnuts, sunflower seeds, or pumpkin seeds, you can swap them for any other type of nuts or seeds. However, don’t substitute the flax seeds or the chia seeds. These seeds have special binding properties, helping the bread hold together. Another such binding ingredient is psyllium. Psyllium is a form of fiber derived from the seeds of the Plantago ovata, an herb mainly grown in India. It comes in two forms – the raw psyllium husks themselves and powdered psyllium. While both forms of psyllium work in this recipe, the measurements are for psyllium husks (not the powder). If you decide to use the powder, you will need much less. I am using a sweetener in this recipe. You can use maple syrup (if you’re not on a keto diet), honey (if you’re not a vegan), or stevia (if … I don’t know; is there any if?). The great thing about this recipe is that there is no blooming, no kneading, no proofing. Simply mix all the ingredients together and bake. Didn’t I say you’ll fall in love with this keto bread? This nut and seed bread is quite unique in that it's not light, fluffy, and airy like your typical flour-based bread. Quite the opposite - it’s chewy, nutty, hearty, filling, moist, and very satisfying. It's also free of grains and pseudo-grains, and very high in fiber and protein. I will go so far as to say that this bread is good for you. Add the almonds, hazelnuts, and pumpkin seeds into a food processor and pulse until they resemble coarse flour. Combine the almond-hazelnut-pumpkin-seed "flour" with the rest of the ingredients. Stir until the batter is combined. Press the batter into a standard loaf pan lined with parchment paper. Preheat the oven to 350°F (175°C) and bake the loaf of bread for 45 minutes. After 45 minutes, remove the bread (together with the parchment paper) from the pan and place it on a baking sheet (or a silicone mat). Bake for another 15-25 minutes. Store bread in a tightly sealed container in the refrigerator for 3-4 days. For longer term storage, slice the bread and store it in an airtight container in the freezer for up to 3 months. Roasted, chopped, and ground nuts go rancid more quickly than whole raw ones. So, storing the bread in a cool place is really important. *I prefer 2 Tbsp. (30 ml) maple syrup, but it's not keto-friendly. This recipe has been adapted from My New Roots. This nut and seed bread is quite unique in that it's not light, fluffy, and airy like your typical flour-based bread. Quite the opposite - it’s chewy, nutty, hearty, filling, moist, and very satisfying. While this recipe is not paleo- or keto-friendly, it's great for those wanting to incorporate more fiber into their diet. Mix the lemon juice with almond milk in a medium-size bowl. Let the mixture stand for about 5 minutes. The almond milk should thicken curdle, mimicking buttermilk. Add the steel-cut oats into the buttermilk. Chill overnight in the refrigerator to rehydrate the oats. When you're ready to make the bread, combine maple syrup and warm water in a small bowl. Sprinkle the yeast over and let it stand until the yeast begins to foam. Whisk teff flour, chopped nuts, seeds, meal, psyllium husks, and salt in a large bowl. Add the re-hydrated oats, yeast mixture, olive oil, and whisk until all ingredients are well combined. Cover the bowl with a piece of plastic wrap and let the dough rest in a warm spot for about an hour. The dough won't rise like non-gluten-free dough, but if you touch it, it should be less dense. Stir dough gently, then transfer to an 8"x 5" (20 cm x 12.5 cm) loaf pan (the dough should reach to about the top of pan and this is fine!). Brush the dough with a little bit of olive oil so the dough doesn't dry out. Cover the dough with a piece of plastic wrap and let it rise again until domed slightly, 1–1¼ hours. Preheat the oven to 350°F (175°F). Bake bread until top is dark brown and sounds hollow when tapped, about 75 minutes. Remove the bread from the pan and let it cool slightly before slicing. Store leftover bread wrapped, in a tightly sealed container, in a dark cool place for 4-5 days. *The prep time does not include soaking the steel cut oats (8-12 hours) and proofing the dough if using yeast, not baking soda (2 hours). I made this bread yesterday and it is absolutely delicious. Instead of the yeast I used some baking soda and that worked very good as well. Thank you for your recipes and inspiration! Great recipe! I can find teff flour do you have any suggestions for substitutions? I can grind my own flour. Thank you. I want to try out this recipe and was just wondering if you can use regular milk or buttermilk instead of almond milk? Hi Karie – yes, you can 🙂 any buttermilk or simple soured milk will work. If I make it with instant dry yeast, the way you made, by mixing water and maple…Do you think it will work?? 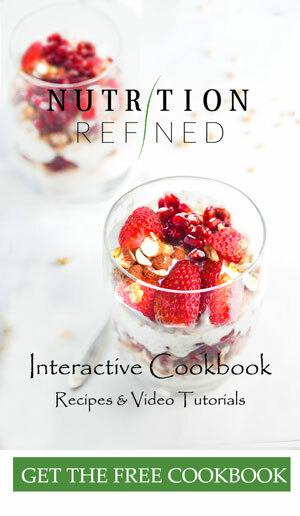 Hi Petra, would you know what the amount of carbs per serving are in this recipe? Thank you. Thank you so much! I am really enjoying all your videos and recipes! Hi Andrea – I am so sorry to hear that! Did you use the exact ingredients or did you substitute anything? (I suppose you didn’t substitute anything since you said you followed the recipe exactly, but I needed to ask). Did you use 8″ x 5″ loaf pan or was your pan a different size? What is your loaf pan made of? I have honestly never had that happen with this recipe. (However, I had that happen with different recipes so I know what you’re talking about). Let’s try to figure out what went wrong. can i use sesame seeds instead of pumpkin? Why did you change your very good previous bread recipe? That is very disappointing! Please list your original recipe again. It was a 5 star recipe. Hi Darcy! I am so sorry!! I was gonna repost that recipe under a different name. I didn’t even think someone could be in the middle of making the recipe. I am so sorry. I will email it to you right away. It will reappear on my site shortly but in the meantime I will send to your email. I just added it back! So sorry for the trouble, Luisa! Wonderful thanks so much Petra!! Hi Darcy – just wanted to let you know that the recipe is back on the blog. Hi, can I subtitute psyllium with others like buckweet or coconut flour? Please repost your original nut & seed loaf bread made with teff flour. That bread is truly scrumptious. Hi Petra, can I subtitute psyllium with the others like buckweet flour or coconut flour ? 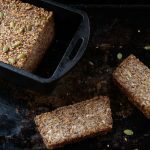 Hi Kenken – unfortunately, psyllium is really important in this recipe because it holds the bread together. If you substituted it with buckwheat or coconut flour, it would likely fall apart. I love this recipes and your other recipes as well. Every recipe of yours that i have made, comes out great! Thank you so much. Your are a great and healthy chef! May I ask about the use of sunflower seeds and baking soda in your Nut & Seed Bread with Steel Cut Oats bread recipe. I made another seed loaf with the two ingredients of sunflower seeds and baking soda which made the loaf turn green. Apparently, the chlorophyll from sunflower seeds reacts with baking soda when heated. Does this occur with your Nut & Seed Bread with Steel Cut Oats recipe? Thank you for reposting your original bread recipe; however, you made some changes. Your original recipe used yeast, certain amount of water & recommended rising time. That has been deleted from the updated version. Please add the instructions as found in your original recipe using yeast. Thank you for a very tasty recipe. Hellow. If i use psyllium powder instead of hasks how much exactly should i use? Hi Thania – I would use 4.5 Tbsp. (the ratio of whole psyllium to powder is about 4:3). Thank you so much! I made the recipe and i just love it! Now we can eat some bread with benefits. I made the bread twice, and both times it came out almost in the center. i find that when cooking with psylium husks it can do this, or is it just me? Its always gummy in the center.. I am sorry to hear that, Rajaa! Is online shopping an option for you? I know that both Amazon and iHerb carry it. Hello Petra, what would the amount be if I sub “ground “flax seed for whole in the Nut and Seed Bread? Much thanks. Hi Petra, I’m interested in trying out the top recipe, but I can’t eat psyllium husks. 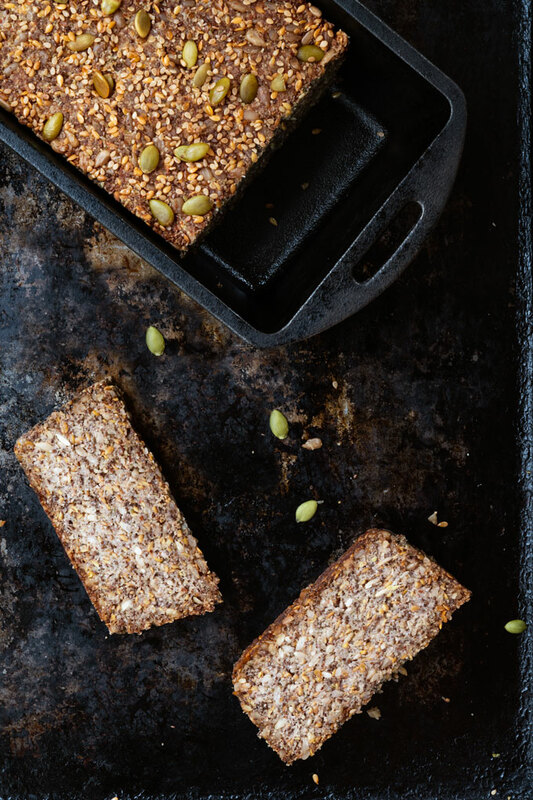 Do you think making a flax egg will help to bind it in place of the psyllium? Thanks for the great recipes! Hi Gabriella – a great question. I haven’t tried it with just flaxseed meal, so I’m not sure. However, I do make bread out of flaxseeds (no psyllium) and it holds up really well, so maybe? I would test just a small batch and see how it goes (so you don’t waste a lot of ingredients). Can you tell me the macros on the first recipe (keto). This looks amazing and after reading most of the comments, I hafta try it! Hi Neha – I tried this bread with olive oil and it worked just fine. So, yes! Just make sure that the oil you use has a high smoking point. Hi Petra, I have few questions. Thank you for the lovely comment Vanesa! ❤️ I didn’t even realize that I forgot to add the flaxseed meal until someone has pointed it out (not sure if it’s in the comments section here or on my YouTube channel). Anyway, I guess the recipe works even without it 🙂 However, I do normally add the flaxseed meal. Every recipe has both metric and imperial measurements. If you need metric measurements, just click on the green link that says “metric” (under the ingredients section in the recipe box) and the ingredients will automatically switch. I have never tested this recipe with the powdered form of psyllium, so I am not sure what the measurements would be. If you use too little, the bread will be crumbly (won’t hold together very well). If you use too much, the bread could turn out a bit slimy (which is the texture of psyllium that is not contrasted with other ingredients). If I had to guess, I would try 1/4 cup psyllium powder. I saw metric measures, it is very helpful, but I didn’t find the measurement of your loaf pan.. So sorry, Vanesa – I misread your comment. The loaf pan is 26 cm x 13 cm (those are the measurements given by the manufacturer). The inside measurements (from one inside rim to the other) are 21.5 cm x 11 cm. is it possible to leave out the whole flaxseeds and substitute it with more (or how much you tell me) of the flaxseeds meal?I only have the flaxseed meal not the whole seeds. Thank you so much, beautiful receipe! Now I’m looking into your seed bread recipe, but I only have the vitamix, I don’t own a food processor. Petra do you think that I can use the vitamix instead the food processor??? Hi Roma – so happy you enjoyed the peanut butter cookies! 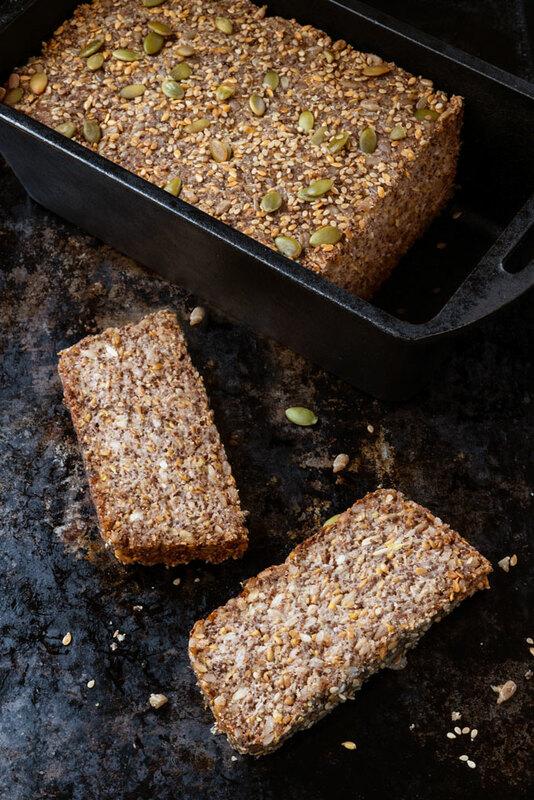 🙂 Which bread are you looking at – the one with or without steel cut oats? I was pleasantly surprised when I started watching people using psyllium husk for baking. It is very popular in India and it is generally consumed by people who suffer from constipation. I saw it in the Indian store the other day and kept wondering if it is the same thing or something different that is used in baking. While I love the recipe, I am afraid to use psyllium husk but then you mentioned in one of your comments that it is a required ingredient as it holds the mixture together. The pictures are gorgeous, both the bread and the crackers. I see. Yes, it can be used as a laxative, but it also reduces triglycerides, cholesterol, blood sugar and blood pressure levels. Here in Canada doctors recommend that psyllium is consumed regularly as a part of a healthy diet.